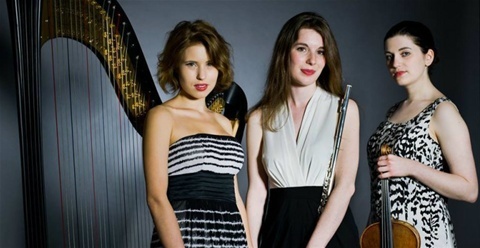 The Globe Ensemble is Britain’s premier harp, flute and viola trio, featuring award-winning Valeria Kurbatova, Luce Zurita and Shiry Rashkovsky. Valeria Kurbatova was born in Moscow, Russia. Her musical career started at the age of 8 when she began studying the harp at the Gnessin State Musical College (one of Moscow’s finest music schools). During her studies at Gnessin, she received a number of prestigious scholarships and awards. These included scholarships from New Names and the Spivakov International Charity Foundation. Valeria has played solo in ensembles and orchestras, in a vast range of concert halls: The Conservatory’s Concert Halls, Rachmaninov’s Concert Halls, the International House of Music, The Barvikha Concert Hall, and The Gnessin’s Hall. London concert halls she has played include: Wigmore Hall, Royal Festival Hall, Victoria and Albert museum, The Barbican and Cadogan Hall. In 2009 she was named Student of the Year in Moscow. In 2011 she graduated from Gnessin State Musical College with the highest level diploma. She is currently studying at the Royal College of Music in London under Professor Ieuan Jones and is receiving a scholarship from ABRSM. In 2012 she won the RCM harp competition. She played in critically acclaimed opera Seven Angels in 2012 and was selected as a Rising Star of 2012-2013 by The Royal College of Music. French flautist Luce Zurita completed her Masters degree with Susan Milan at the Royal College of Music in London, and previously studied at the Conservatoire of Rouen with Jean-Christophe Falala. A finalist of the Croydon Concerto Competition 2013, she was awarded the Charles Sampson “Young Soloist” award and the Jellinek Prize and performed with various orchestras as a soloist, notably in Cambridge West Road Concert Hall. As an orchestral player, Luce played under the baton of Vladimir Ashkenazy and Bernard Haitink and was invited in Buckingham Palace for HRH Prince Charles’ birthday as principal flute of the RCM Chamber Orchestra. A keen chamber musician, she performed in Royal Albert Hall’s Elgar Room, Kings Place, the Houses of Parliament, V&A Museum, the National Gallery with the Globe and Giverny Ensembles. A keen advocate of creation, she records actively for film composers and works alongside various composers. She premiered numerous works and was broadcasted BBC Radio 3. Luce holds a Master-degree in French and Comparative Literature from Paris-IV-Sorbonne university. She used to be Bachtrack French editor and is now a writer for the Opera of Rouen Normandie, a lecturer and a musicology researcher. Luce was sponsored by the Leverhulme Postagraduate Studentship as an RCM scholar, Lee Abbey London and the Rotary International Club. Following her critically acclaimed Royal Festival Hall debut, Shiry Rashkovsky pursues an international solo, chamber and teaching career. She was a prize-winner of the Cecil Aronowitz Viola Prize, Philharmonia Orchestra Meyer Award, Countess of Munster Musical Trust Recital Scheme, and Martin Musical Scholarship Fund. Highly in demand as a concerto soloist, performances include engagements with the New Music Ensemble, Kallion Ensemble, Lady Clare Players, Cambridge Symphony Orchestra ‘CUMS’, and Barnet Symphony Orchestra. She has broadcast live for BBC Radio 3 and BBC4, New York’s WQXR, Italy’s RAI, and the Israeli Broadcasting Authority. Alongside Robin Green (prize-winner, YCAT, ROSL, Park Lane Group), she has toured England and Wales as part of the few established piano and viola duos. Invitations to festivals of renown include Prussia Cove Open Chamber Music, Keshet Eilon International Music Centre, and Bowdoin International Music Festival, where she has performed as a soloist and in chamber ensembles with Shmuel Ashkenasi, Shlomo Mintz, and members of the Nash Ensemble. Sought after as a teacher, Shiry was appointed Professor of Viola at Royal Holloway, University of London in 2013 and is a faculty member of New Virtuosi International Mastercourse and LeAltreNote Music Festival. She currently freelances regularly with the Philharmonia Orchestra and BBC Symphony Orchestra, and has performed as principal viola for MultiStory and the ‘NonClassical’ collective. A proponent of contemporary music, Shiry gave the world premiere of Kate Whitley’s Viola Concerto which was dedicated to her in 2010. Shiry obtained a BA in Political Science at St Catharine’s College, Cambridge, and an Artist Diploma and Masters of Music with First Class Honours at the Royal College of Music, where she studied with Natasha Boyarska and Ian Jewel.